21-22 Nov, 2016: International Conference on Forestry and Environment: Challenges and Prospects at University of Agriculture Faisalabad. 6 Jun, 2016: Conference on Agriculture productivity improvement through nudging at Pir Mehr Ali Shah University Rawalpindi in partnership with University of California Davis. 5 Jun, 2016: Training seminar on Cultivation of Toxic Free Vegetables in Arid and Semi-Arid Regions has been organized by Arid Zone Research Institute, (PARC) Umerkot. 2 Jun, 2016: National Stakeholders Consultation Workshop for Prioritization on Climate Change Adaptation in Water, Agriculture and Energy Sector at National Agricultural Research Centre (NARC) under the PSDP project titled "Himalayan adaptation, water and resilience (HI-AWARE) research on glacier and snowpack dependent river Basin for improving livelihoods. 1-3 June, 2016: 3rd International Conference on Agriculture and Forestry (ICOAF). Sofitel Philippine Plaza Manila. 31 May, 2016: Seminar on Small Farmers Access to Resources and Knowledge Issues & Options held at PMAS-AAUR. 20 May, 2016: Seminar on Saemaul Undong and its lessons for escape from Rural Poverty in Pakistan at Pir Mehr Ali Shah Arid Agriculture Rawalpindi (PMAS-AAUR). 7-8 May, 2016: International Workshop on 4R Nutrient Stewardship for Food, Economic and Environmental Security. 5 April, 2016: Seminar on Food Security and Export of Vegetable held at Pir Mehr Ali Shah Arid Agriculture Rawalpindi (PMAS-AAUR). 5-6 Apr, 2016: Dawn Pakistan Food & Agri Expo. Exhibition as platform for all business and government sectors, directly or indirectly involved with agriculture and food industry of Pakistan. By the DAWN Media Group at Expo Centre, Lahore. 24 Mar, 2016: International Seminar on World Water Day at University of Agriculture Faisalabad. 15-17 Mar, 2016: 16th International Congress of Soil Science. By Soil Science Society of Pakistan in collaboration with Department of Soil Science & SWC PMAS-AAUR. At PMAS-Arid Agriculture University Rawalpindi. 22-24 Feb, 2016: International Conference on Biochemistry, Biotechnology and Biomaterials. Theme: Biochemistry for better food, health and nutrition in developing countries. University of Agriculture Faisalabad, Pakistan. 18-20 Feb, 2016: 2nd International Conference on Horticultural Sciences. By the Institute of Horticultural Sciences, University of Agriculture Faisalabad. 7 Feb, 2016: Pakistan Edible Oil Conference (PEOC). Organized by the Pakistan Vanaspati Manufacturers Association at the Movenpick Hotel Karachi in Karachi. 20 Jan, 2016: Training Workshop on Drip Irrigation Systems for Vegetables and Nurseries held at NTHRI, Field Station Mansehera, KP. 20 Jan, 2016: Training Workshop on Tissue-Culture and Micro Irrigation Systems for Tunnel Farming held at NSTHRI, Thatta-PARC, Sindh. 8-10 Dec, 2015: 1st Pakistan Congress on Seed. By the University of Agriculture, Faisalabad and Seed Association of Pakistan at UAF (flyer). 9 Dec, 2015: One day seminar on Healthy Soils for Sustainable Agriculture. By the Agriculture University Rawalpindi and Soil Science Society of Pakistan. 6-8 Dec, 2015: 4th International Conference for Global Sustainable Development. Karachi, Pakistan. 1-2 Dec, 2015: Organic Innovation Days. TP Organics. Brussels, Belgium. 23-25 Nov, 2015: 2nd International Workshop on Applications of ICTs in Education, Healthcare and Agriculture. Jointly organized by COMSATS, the Islamic Educational, Scientific and Cultural Organization (ISESCO) and the Inter-Islamic Network on Information Technology (INIT). At National Institute of Posts and Telecommunications (INPT), Rabat, Morocco. 15-17 Nov, 2015 International Conference on "Soil Sustainability for Food Security". Institute of Soil & Environmental Sciences, University of Agriculture Faisalabad. 9-20 Nov, 2015 Second Regional Training Course on "Sampling Methods for Producing Core Data Items for Agricultural and Rural Statistics". Jakarta, Republic of Indonesia. 6 Nov, 2015: Seminar on "Agriculture program technique: statement by the Chairman of PARC, Dr. Nadeem". PARC got a number of opportunities to facilitate the project in conducting on-field capacity development programs covering various aspects of project-focused value chains. At local hotel in Islamabad. 4 Nov, 2015 Annual Irrigation Conference, Raleigh, NC. 3-4 Nov, 2015 International Conference on "Impacts of agricultural research - towards an approach of societal values". French National Institute for Agricultural Research (INRA). Paris, France. 2-6 Nov 2015 5-day workshop on Student Satellites. Inter-Islamic Network on Space Sciences & Technology (ISNET), in collaboration with SUPARCO. At Lahore, Pakistan. 26-29 Oct, 2015 15th International Scientific and Technical Conference "From imagery to map: digital photogrammetric technologies". Yucatan, Mexico. 26 Oct, 2015: Inaugural session of four-day training Workshop on Agro-Ecological Monitoring of Rangelands, Islamabad. 25-28 Oct, 2015 ABA National Agricultural Bankers Conference. Kansas City, USA. 22-24 Oct, 2015 International Conference on "Crop Production for Food Security. Theme: Ensuring food security from declining resources". University of Agriculture Faisalabad, Pakistan. 6-8 Oct, 2015: Summit 2015 on "Eye on Earth". Abu Dhabi, United Arab Emirates. 19-23 Oct 2015 2015 International Soil Science Congress on "Soil Science in International Year of Soils" Sochi, Russia. 11-14 Oct 2015 2nd International Conference on "Global Food Security" Cornell University, Ithaca, New York, USA. 6-10 Oct, 2015 International Society for Digital Earth 2015. Halifax, Nova Scotia, Canada. 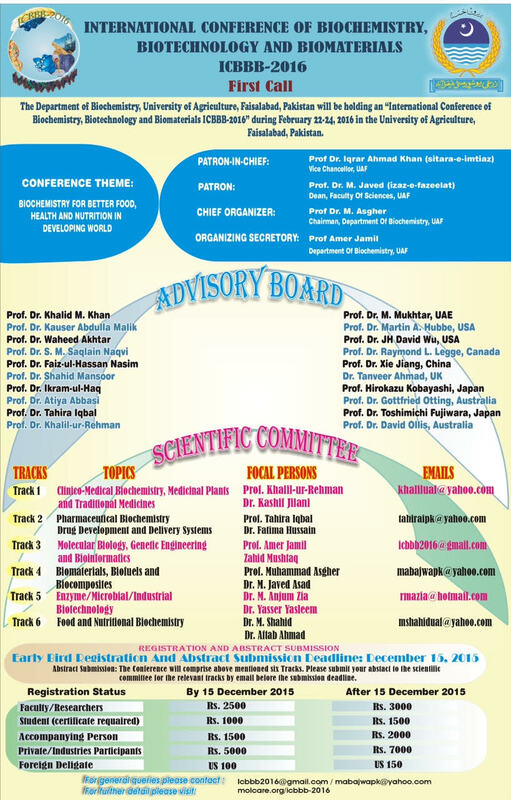 19-23 Oct, 2015 51st ISOCARP Congress. Netherlands. 28 Sep - 3 Oct 2015 20th Event on "ISPRS Geospatial Week". La Grande Motte, France. 14-18 Sep 2015 20th International "Soil Tillage Research Organization (ISTRO)" conference, Nanjing, China. 7-11 Sep 2015 "14th World Forestry Congress". Republic of South Africa. 7-10 Sep 2015 International Symposium on "Integrated Space Technology Applications for Climate Change". UNOOSA, Austria. 2-4 Sep 2015 Fourth International Conference on "Aerospace Science & Engineering (ICASE)". Institute of Space Technology (IST), Islamabad, Pakistan. 1-4 Sep 2015 International Symposium on "Integrated Space Technology Applications for Climate Change", UNOOSA, Austria. 26-31 Jul 2015 International Symposium on "Geoscience and Remote Sensing (IGARSS) 2015", Milan, Italy. 29-30 Jul 2015 International Conference on "Advances in Environment Research (ICAER 2015)", Jeju Island, Republic of Korea. 16-17 Jul 2015 International Conference on "Agriworld Australia 2015", Sydney, Australia. 25-26 Jun 2015 International Conference on "Water Technology (ICWT 2015)", Bangkok, Thailand. 11-12 Jun 2015 2nd International Conference on "Advances in Environment, Agriculture & Medical Sciences (ICAEAM'15)", Bangkok, Thailand. 10-12 Jun 2015 TIIKM's 2nd Annual International Conference on "Agriculture and Forestry 2015: Sustainable Agriculture and Global Food Security", Colombo, Sri Lanka. 9-10 Jun 2015 International Workshop on "Supporting Future Earth with Global Geo-Information", Beijing, China. 26-28 May 2015 36th UN International Conference on "Earth Observation - Global solutions for the challenges of sustainable development in societies at risk", Germany. 11-15 May 2015 36th International Symposium on "Remote Sensing of Environment (ISRSE)", Berlin, Germany. 3-7 May 2015 The AGU 2015 "Joint Assembly" at the Palais des congrès de Montréal, Montreal. 22 Apr 2015 Agri Innovation 2015 "Emerging Science and Technologies in Crop Research", by SCI's Agri-sciences Group, RSC and AGRI-net. 12-17 Apr 2015 European Geosciences Union "General Assembly 2015", Vienna, Austria. April 9-10, 2015. International Conference on "Remote Sensing and Applications (ICRSA)", Los Angeles, USA. March 27-29, 2015. 3rd International Conference on "Value addition and innovation in textile", National Textile University, Faisalabad, Pakistan. March 9-11, 2015. Global Forum 2015 for "Innovations in Agriculture", Abu Dhabi, United Arab Emirates. February 11-13, 2015. International Conference on "Citriculture: Challenges and Management", Bahauddin Zakariya University, Multan, Pakistan. January 13-17, 2015. 12th International Bhurban Conference on "Applied Sciences & Technology (IBCAST)", at National Centre for Physics (NCP), Islamabad, organized by Centres of Excellence in Science & Applied Technologies (CESAT).